The actual amount of skills / abilities we bring to an individual mission is too limiting imho. If someone favours a particular weapon and armour, the gameplay will be very samey in every mission as well. Other arpgs which I enjoy, I've dozens of skills and abilities to utilise, looking at Van Helsing and Grim Dawn for example, but with Inquisitor its just a mere half dozen button presses and l-click, r-click. I fear that'll get too boring too quickly for the game to be enjoyable over tens of hours of gameplay. Don't get me wrong, what is there is enjoyable, but there isn't enough to sustain interest over a longer haul. I think the Weapon choice consumes too many skills which are rarely usefull. If you consider that as of now you have six skills on your bar. Four Weapon Skills, Grenade, and Armor Skill. You also have a weapon in the other slot that gives you four more. Thats a total of 10 skills. It's been my experience that end game boils down to specs that involve only a few abilities. There are only so many clicks to be had in between cooldowns. Even now with a weapon with four abilities I rarely use all four in a rotation. I'm not trying to argue either way, I like theory crafting so the more the merrier. :) If you give me 20 abilities I'll just cut out the few I need for my rotation. Something I would like changed currently when you dual wield pistols you loose 4 abilities. 1 and 2 key becomes the LMB and RMB of your off hand Pistol. There are some amazing pistol abilities on 1 and 2 i would like to be able to still use. I think adding separate skills that could be added to 5-8 would be a major improvement to the game. This could be anything from boosts, shouts, drone/cover summoning, charge abilities that lies outside that of the skills from the weapons. It would make the game a lot more flexible and a lot more interactive. Grenade is one of the abilities, that we can change back and forth. In total it could be three slots extra for skills. Citing 20 years experience playing games isn't an argument, Aedwynn. I've probably as much, if not more being in my mid-40s. Arpg wise I've hundreds of hours in each of every big arpg release out there. I specifically refer to Van Helsing and Grim Dawn as highlights of the genre, for me. The reason I bring up my criticism of the current skill variety you can use per mission in Martyr is because I feel variety and keeping things fresh will be key to the longevity of the game for me personally, and probably others. I want this to be a game I can sink 100+ hrs into. Absolutely agree with you fun isn't in how many skills but what you can do with them, but again how much variety is there, currently? If this game can get the depth of Diablo 3's gameplay systems it'll be a winner, but lets not try and draw that comparison for now eh? Because that would be silly and it really doesn't reflect where Martyr is at. I play games for 20 years. I played different kinds of RPGs through the ages and can't remember a single one where number of skills on hotbar translated into quality. Yeah, there are games out there where you can fill your screen with 8 hotbars, 10-12 skills in each. Does that make game fun and interesting? No. Take any modern MMO as example. During combat you actively use 4-12 skills. You can add here around 2-6 buffs that you renew once per hour. Then what about 60-80 other skills on your screen? They are situational and mostly related to transportation, crafting, resource gathering. Most of them are just item/gamesystem shortcuts so you don't need to open your inventory or browse game menu (like crafting). Take Diablo 3 for example. How many skills you have there? 6 combat, healing and portal. That's all. 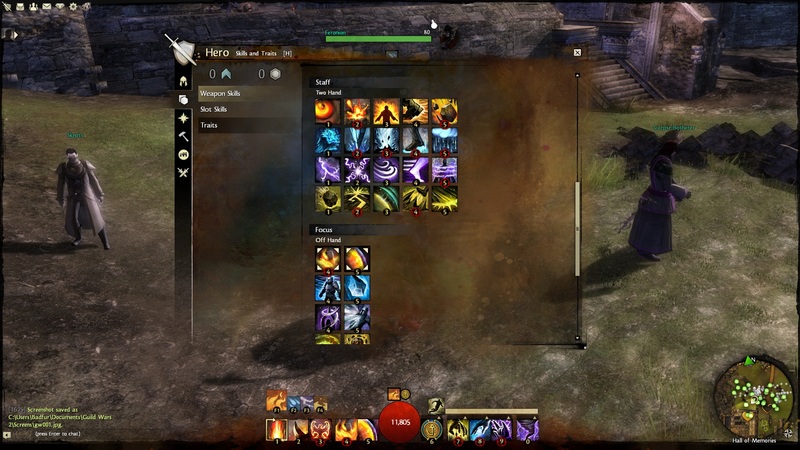 You can put all buttons from smith, enchanter and jeweler on screen and add all not currently selected skills as greyed out or put them on a shared cooldown. Will that make Diablo 3 more interesting? It won't. Fun is not measured in how many action bars you have but what you can do with those skills. If you got few available skills but they interact with environment in many ways - it is far more interesting than having 80 buttons you won't use. Also, for now we can't use Inventory during missions. As such even if you bring spare guns, you can't swap them right now. But as I understand that is bound to change in the future. With combat skills bound to weapon it means that in the future you will be able to bring more options to the battle if you so desire. With respect, I absolutely understand it is alpha right now and far from a finished product. And right now, my feedback is there aren't enough skills to play with within a mission. L-click, r-click, 1 to 4 and q. Other arpgs, I have several hotbars full of abilities to deploy. This won't hold my interest over the long haul, even if different equipment sets offer different skills, the range of options brought to a particular mission is still the same and I feel the gameplay will get stale too quickly. If this gets taken on board and expanded, great! But there hasn't been any indication of that so far (and the ui doesn't hint at it), so *now*, in alpha, is exactly the right time to air my concerns. You are playing alpha right now, no wonder there isn't much content present at this stage. What you are playing right now is just barebones of sandbox part. Not all mission types present, only a few of environment types are in. Same for game systems - crafting is oversimplified right now. It seems to me that you are making same mistake a lot of people do - you treat this as a final product simply because you can play it. You understand that this is not a finished game, but deep inside you expect it to be fun, interesting and involving even now. In other words you are trying to play it instead of testing it. Ok, trying again. The actual amount of skills / abilities we bring to an individual mission is too limiting imho. If someone favours a particular weapon and armour, the gameplay will be very samey in every mission as well. Other arpgs which I enjoy, I've dozens of skills and abilities to utilise, looking at Van Helsing and Grim Dawn for example, but with Inquisitor its just a mere half dozen button presses and l-click, r-click. I fear that'll get too boring too quickly for the game to be enjoyable over tens of hours of gameplay. Don't get me wrong, what is there is enjoyable, but there isn't enough to sustain interest over a longer haul. Also, if you are going to keep playing, do not go past power level 1 at all. It is just a really bad idea at the moment. It seems like it really doesn't like formatting or spaces between paragraphs. Perhaps it isn't playing nice with the Edge browser? This commenting system is appalling. I've lost what I've typed out four times already. Also looking at the gameplay loop, I'm hoping for more than just running around killing stuff. Interacting with consoles, deactivating forcefields, interrogating a downed enemy npc. Things to shake up the routine, keep immersion high and bring a bit more feel of being an inquisitor.